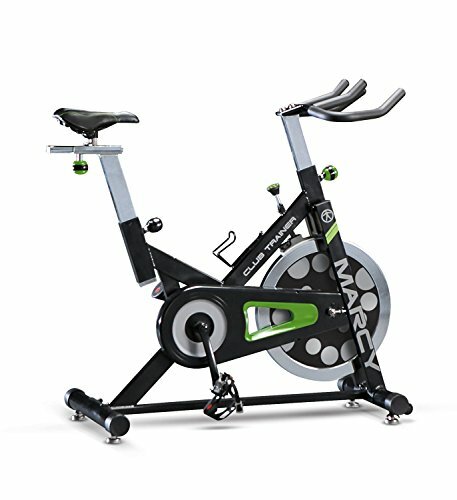 Burn the fat and gain some muscle with the Marcy Club Revolution Cycle Trainer! This training equipment allows you to experience an intense cardio workout in a stationary position. As you shed calories during cycling, there are noticeable improvement in your cardiovascular health, stamina, and breathing. It also increases muscular endurance, as it strengthens your hamstrings, quads, buttocks, and back. 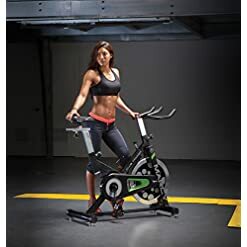 This stationary cycle trainer is easy and safe to control, since it has a durable frame and construction. The frame of this stationary bike is made of heavy-duty steel. It is resistant to rust and corrosion, as it is made of steel with sturdy welding points and a powder-coated finish. It also uses a chain-drive mechanism that is connected to the 40-lb flywheel to assure steadiness and maximum performance. Its solid pulley can support a maximum of 300 lbs. of weight in a complete stand-up posture. 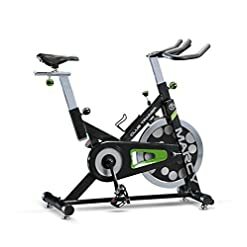 This exercise bike also features a quick-stop mechanism that allows you to stop the wheel’s motion easily and uses an adjustable resistance knob that lets you adjust the intensity of your ride. This equipment is ergonomically designed for optimum comfort and ease of use. 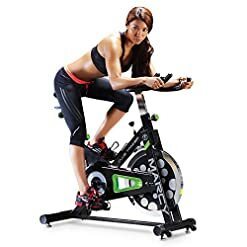 It has a road bike-style saddle with adjustable rubber foam paddle handle bars that adjust vertically and a seat that can be adjusted both vertically and horizontally. This cycling trainer also has a water bottle holder, which makes it easy for you to rehydrate as you exercise without having to leave the seat. SAFE TO USE -With its durable frame and construction, this equipment is easy and safe to control. Its solid pulley can support a maximum of 300lbs. of weight in a complete stand-up posture. This exercise bike also features a quick-stop mechanism that allows you to halt the wheel’s momentum easily.